One of our most popular high school graduation party favors (but they work equally as well for college graduates)! The day has come to start a new chapter in your life! Celebrate your achievements by giving your guests a memento of your graduation day. Add your name and graduation date to remind your friends and family of the big event. Each 3 1/4" x 4 1/4" notebook favor opens to reveal a blank white notepad inside and a convenient attached white pen. Hi, I'm interested in the congrats grad note pads, are there any other colors? Yes, you can design and choose your own Background or Top Color, Border or Bottom Color, Pattern Color and font color. 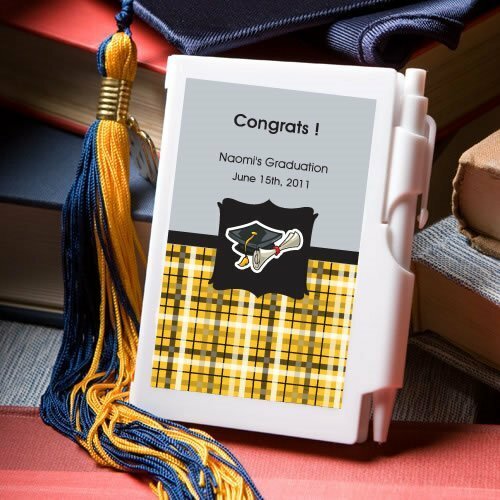 You can select different designs and you can see that option under personalization after adding the Congrats to the Grad' Notebook Graduation Party Favor to your shopping cart.